A bittersweet story about an impossible decision that must be made in the blink of an eye. “Should we get an automatic or manual?” Daniel asked as he stared at the watch crescent under Dr. Branson’s sleeve in a failed attempt to discern its pedigree. Daniel knew he should be focusing on Delilah, but he was holding her hand, and that helped. Her face and subdued groans revealed that Delilah’s discomfort was still tolerable, so he didn’t need to give her his full attention. Not yet. Daniel had an urgent question he needed answered, and quickly. Besides, Delilah wasn’t going anywhere. The small room whirred with gauges and dials. Periodically a muffled announcement from the hallway speaker tried to barrel its way into the room but was masked by a cacophony of beeps and buzzes. The noises annoyed Daniel, but seemed to have lulled Delilah into a light trance. Every now and then a new person popped into the room, but mostly it was just the five of them: Dr. Branson, Delilah, two nurses, and himself. Daniel waited a few seconds, but Dr. Branson didn’t answer. Maybe he didn't hear me over the machines and chit-chatting nurses. He’s distracted. California doctors are always distracted, thinking about their patients, their next patients, the last patients of the day, and how far along they are to a down payment on a yacht. A bolt of panic stiffened Daniel’s back. What does that mean? The hospital is supposed to have a supply parents can choose from. I read that! But what if they don’t? What am I going to do? Daniel thrust his wrist forward, forcing his Breitling Navitimer out from under his sports jacket. It read 5:44 a.m. There weren’t any watch stores open at this hour, and he doubted any would be opening before 10 o’clock at the earliest. Do 7-11s sell watches? Daniel didn’t recall ever seeing a watch for sale there. What about pawn shops? No, no, that wouldn’t work. A pawned watch is only for poor people who can’t afford a new one. They’re dangerously unreliable. Yeah, a used watch like a Rolex Oysterdate might last a lifetime. But it also might conk out after just a week. Daniel wiped away the nascent tears that thought brought to his eyes. He had read about second rate watches the poor had to get for their babies. The newspapers thrived on daily sob stories about somebody who put a used watch on their newborn, only to have that watch stop running days, weeks, or months later. The baby passed away before they had a chance to blow out a solitary candle on a cake. So heartbreaking. Sure, a cheap watch is all some parents can afford, but that doesn’t diminish the sadness. Daniel sniffled and wiped his arm against his nose. One day America will provide a new watch to every newborn, but we’re not there yet. Until then, children will needlessly die. Daniel heard the unspoken “tsk” in Branson’s question. “No, no. Not yet. We thought we could do it here. Doesn’t the hospital sell watches? A choice, too? I’m sure I read that,” Daniel said, as if his assertion could bend reality to his need. Daniel scanned his memory for the brochure in which he was sure he read that you can buy your newborn a watch while your wife is in labor. Daniel touched his left wrist with his fingertips. His pulse was racing like greyhounds chasing after a mechanical rabbit at a race track. “A little. I’m inclined to get a manual; Delilah thinks Debra should have an automatic. But we could both be easily swayed.” Daniel cocked his head to the side and looked down toward Branson’s left wrist. “Dad’s father was in the navy. A diver actually. I guess grandfather felt a close kinship with all things navy, so he gave Dad a Fifty Fathoms in 1953. Dad thought I should beat to a different drummer, so he got me a Breitling Navitimer, a pilot's watch, navy’s arch rival.” Daniel could see the “lol” float out his mouth like he was in a cartoon. “Yeah. I am. You’re fortunate with your Grand Seiko, too. ‘May your timepiece forever beat, ’” Daniel replied, offering the salutation of friendship and hope. “Excuse me,” Branson said. Branson looked at Delilah and placed his hand on her belly, holding it there silently for thirty seconds. He then put his hand on the left side of Delilah’s neck, moving it around the front and to Deliah’s right side. “How are you feeling?” Branson asked. “Great and terrible.” Delilah forced a smile, rubbed her belly, and turned the forced smile into a real one. Branson pivoted back to Daniel, speaking swiftly, words tumbling out of his mouth like a broken bag of marbles. “I’m going to be busy soon. 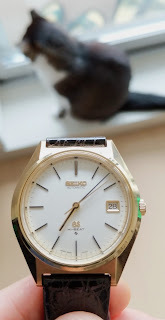 Grand Seiko is a great watch. That part about how our parents choose our watches—I probably would have picked a Grand Seiko had I been able, which, of course, I wasn’t. I like the watch’s simple elegance. You might as well enjoy your watch because you’re stuck with it for your entire life. ‘Enjoy your gift of time,’” Branson said, returning Daniel’s salutation with another. “One last question,” Daniel said, pressing his hands together in a universal sign of thanks. “You’re happy with a manual wind?” Daniel asked, uncertainty breaking his words into small fragments. Daniel briefly turned toward Delilah, whose forehead was being wiped with a damp cloth by the nurse. “Few hours!” Delilah screamed. Daniel saw Cthulhu superimposed over Delilah’s face. “I can’t even do this for a few more minutes!” The nurse grimaced but stayed silent as Delilah grabbed the wrist opposite her watch, and squeezed hard. She’d been on the receiving end of a patient in pain before, an unavoidable side effect of being an OB nurse, and barely winced. “Can I have something for the pain, then? Wait. Ooooo! Awwww! “Delilah just reminded us why we’re here,” Branson said. Branson glanced at nurse Amy Wu, and gave her a knowing curl of his lip. She knew the drill. When the time was right, and it almost was, she could summon the anesthesiologist. His team worked together as if they shared the same ESP channel. “How did what happen?” Branson shot back. Daniel’s creased forehead revealed his annoyance with Branson answering his questions with a question. “Yep. But you’re about to have a baby, so you should be talking about happy thoughts, about bringing a new life into the world, about all the joy you’ll experience. The why isn’t important. You just do what you need to do, like every parent for the past sixty-five years: Wind Debra’s watch daily. It will become routine before you know it. And daily watch winding is more fun than changing diapers. Trust me on that.” Branson warmed the business end of his stethoscope against his hands, lifted Delilah’s pink and white striped hospital gown, shushed Daniel again, and listened. “Great. Everything’s great. Two strong heartbeats,” he said to Delilah, as he gave her a thumbs up. “A quantum event could affect the entire world, even the entire galaxy, instantly. ‘Spooky action at a distance’—isn’t that how Einstein described quantum effects? And when you think about it—and we really, really should be thinking about your baby, Mr. Dunn, and not the world of watches in which we now live and which scientists have examined endlessly—there’s bound to be some kind of inexplicable interaction between quantum events, time, and timepieces. That makes the most sense for something that can’t be made sense of. Daniel’s pupils widened to black orbs. He knew all this, of course. He’d worn a watch his entire life, never taking it off for a second. Not for sports. Not for showers. Not for love-making. Not for getting a tan on the beach. That he was breathing was a testament to that obvious fact. His Breitling was his constant companion, but companion’s not the right word. Daniel’s Breitling was his second heart, as essential as the flesh and blood heart that beat inside him. But today felt different. His child, his Debra, was about to be born, making it his and Delilah’s responsibility not just to choose the right watch from day one, but ensure it was always wound and working. A loud roar filled the room as if a thousand construction cranes collapsed at the same time. Instinctively Daniel gripped the railing on Delilah’s bed. So did Branson and the two nurses. Daniel’s grip increased in intensity as the shaking grew stronger. And louder. The analog clock above the door jumped off its hook and crashed onto the ground, the plastic shattering into a hundred shards. Random objects and medical equipment scattered across the floor, turning the white linoleum into a carpet of shattered glass and metal fragments. Delilah’s glass of ice chips spilled onto her bed. Fighting against unwavering gravity and motion, nurse Wu lifted up the railing on the open side of Delilah’s bed as far as it would go. Harsh alarms rang in the hallway. Machines in Delilah’s room loudly objected to having their wires and tubes ripped from them. “Hold on everyone. The quake will pass,” Dr. Branson shouted over an unintelligible automated announcement and the endless crashing of equipment. The walls scraped against each other, sounding like boulders being dragged across a gravel pit. “Okay, okay,” Daniel replied over the rumble of falling objects and moving walls. He locked his gaze with Delilah whose eyes were wide with fear and pain. “I hope it’s over soon!” he said to nobody in particular, words he had last uttered on a fearful rollercoaster ride. Then why is this earthquake going on forever? “It can’t be—” Branson stopped talking when the lights went out. The shaking stopped, and the world around them went silent as if all sound had been sucked into outer space. “The lights are out,” Cole said. “Not fine,” Cole said. She was kneeling on the floor in front of a fallen Amy Wu. “Step aside,” Branson commanded. “Let me examine her.” Branson brushed away broken glass and debris with his foot and started to lower himself to the floor. “No need,” Cole said. She pointed to Wu’s Timex. The watch crystal looked like a shattered snowflake. The watch’s copper colored hour hand and broken off, and the watch case was marred and bent. The second hand was motionless. “It always is,” Branson said. Cole shot up. “I’m ready. Let’s make a baby,” she said. “I’m going to catch the head,” he told Cole. “No, no, you have to wait,” Daniel said again. He grabbed Branson’s arm. “No, no, no!” Delilah screamed. Daniel’s eyes welled with tears. He lifted his hand to his face to rub away his tears away but changed course because he needed to feel the rain falling down his cheeks and taste the salt on his tongue. “It’s okay. It’s okay.” He tried to swallow, but there was nothing. Daniel leaned over the bed, kissed Delilah’s lips, and spoke quickly, “I always dreamed about passing my watch down to my child.” He unbuckled his Breitling, removed it from his wrist, placed it in Delilah’s hand, and guided her warm fingers around the ticking watch.